Madison, Hayden and Logan all ready for action! There were once two children who attended a large karate dojo. 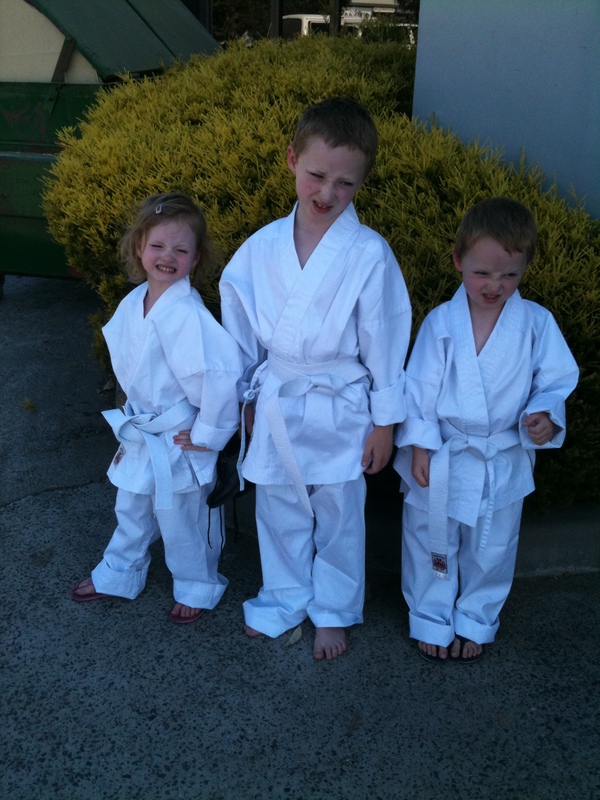 They were both keen to improve their martial arts skills and impress their sensei. Every time their sensei barked an instruction something interesting would happen. The first child would immediately respond with what he thought was the right thing to do. He would jump into a position and act according to his understanding of the instruction. The second child would hesitate and watch everyone else to see what the right thing to do was. He waited until they were all in position and then copy them. As a result of their default responses something happened that defined how competent they got at karate and more importantly how they responded to life. By acting immediately, the first child made a lot of mistakes. He stood out from the rest and often had to be corrected by the instructor. Sometimes, the other children would laugh at his errors. By watching everyone else, the second child made no mistakes. He conformed to the rest of the class and needed no correction. No-one ever laughed at him. The first child was undaunted. He continued to respond immediately to the sensei and over time, his mistakes became less and less. He went from needing to be corrected the most, to being praised the most and he soon progressed through the different belts. The second child remained hesitant. He was always on the lookout for what everyone else did and as a consequence didn’t learn about karate, but about copying others. He faded into the background and his progress was much slower as he became less instinctive about martial arts and more concerned with the opinion of others. If you want to be truly great at anything, let me encourage you to be more like the first child. Elite performers are wired for action, aren’t afraid to make mistakes and listen to their mentors. Average performers procrastinate, are more concerned about the opinion of others and would rather conform to the crowd than bring unnecessary attention to themselves. Jump into action and stand out from the crowd. Previous post – Who’s Going To Be You? Next post – Do You Get Paid To Be Unhappy? Another amazing post Darren. Being elite is what everyone of us is dreaming of. can I reblog this on zendictive? Yes, I am more than happy for you to reblog this. Thanks for asking. « Who’s Going To Be You?